Anticipation is in the air. Twinkling lights. Aromatic, evergreen boughs. Crackling fires. Stories. There are so many simple things to love about the coming holiday season and winter months. 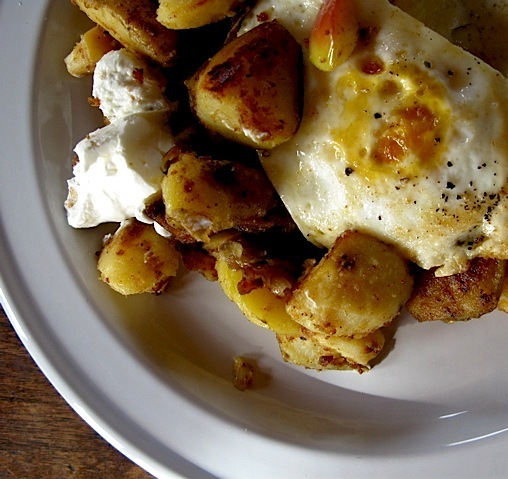 For me, late morning breakfasts always top the December weekend-pleasures list. After a busy year, doesn’t it feel luxurious to enjoy a leisurely morning at the sun drenched table, sipping coffee and lingering over scattered newspapers? Or better yet, how about a half day spent sprawled out upon the king size bed with a tray of warm pastries and a pot of steaming tea? Oh, the delights of the quiet season ahead. And while it is certainly a feast made for lovers, brunch is also a fun meal to share with family and friends during the holiday season. This is the time of year when I begin to pull out my favorite, dog-eared cookbooks, returning to the eagerly anticipated smells of homemade brunch. Although there are many fine culinary titles collecting dust on my shelves, there is one that never needs brushing off – Marion Cunningham’s Breakfast Book Marion’s delightful little collection of recipes has long been my secret, brunch-weapon. French toast, eggs, waffles, potatoes, muffins, cakes; Marion has included everything your heart could possibly desire. She even has a brunch-defining recipe called the ‘Sunday loaf’. Exactly what I was thinking Marion – exactly. 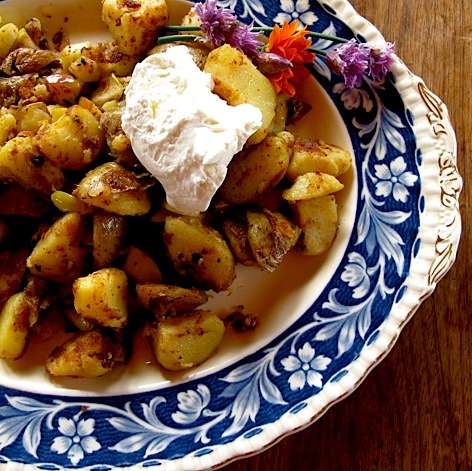 Late last night before turning in, I boiled some homegrown Yukon gold potatoes to enjoy in my own, modified version of Marion’s ‘Apple Potato Fry’ this morning. I have altered the recipe a bit to include sweet onion from my kitchen garden and heirloom lady apples, (see photo notes below), from local Scott Farm Orchard. 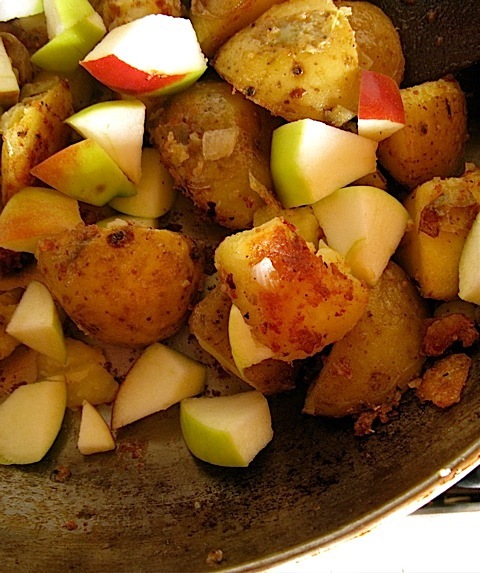 When I got up today, I simply fried the potatoes, added fresh diced apples, a bit of onion, and cooked it for a few minutes while I stoked the fire. When done, I topped the whole thing off with fried eggs and farm-fresh sour cream. It was pretty much heaven – and since this is the season of giving, I felt I should let you in on it…. Wash, core and dice the heirloom Lady apples, (about 1/8-1/4″ thick). I leave the skin on for color and flavor. 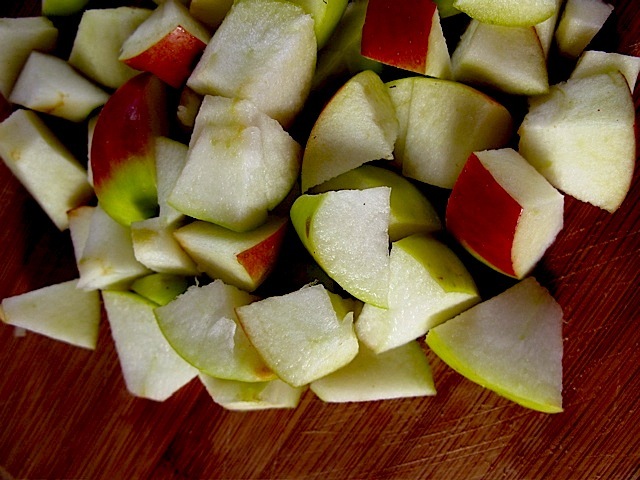 Place apples into a small bowl, tossing with lemon juice. Set aside. Peel and chop the sweet onion, medium dice. In a small skillet, heat 1 table spoon of vegetable oil over low heat. Raise the burner temp. to medium, add the onion and cook until translucent, (about 5-7 minutes). Remove onion to a plate and set aside. In a large skillet, (one with a lid), heat the butter and remaining oil over low heat. 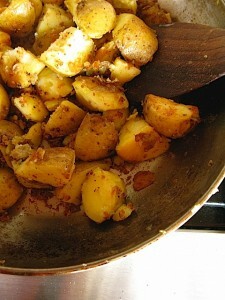 Meanwhile, cut up the left-over potatoes into 1/8-1/4″ dice, (or use freshly boiled potatoes, patted dry). I always leave the peels on my boiled potatoes for vitamins and texture, (I simply wash and scrub them clean before cooking). As you turn the burner up to medium, slowly add the potatoes, spreading them evenly in the skillet. Add salt and pepper. Cook potatoes on one side until crispy and brown, (5 minutes), turn and brown again, (another 5 or so). 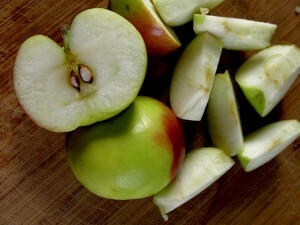 Drain the lemon juice from the apples and pat them dry. When potatoes are a crisp, even, golden brown, add the apples and toss well. Cover with a lid and cook over high heat for two two to three minutes. Uncover, stir and add sweet onion. Cook uncovered for a few more minutes. Remove to a serving platter and serve hot with fresh sour cream. You are currently viewing the archives for Saturday, November 28th, 2009 at The Gardener's Eden.